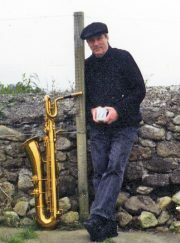 On Friday March 4, it was the turn of Keith Donald, a musician renowned in his native land and beyond for playing countless gigs at prestigious venues with stars such as Van Morrison. But, as he tells us, in his highly confessional one-man play, he was an alcoholic mess. He had his first serious taste of alcohol at the age of 11 and by the time he left school, he had already spent a night in the cells for being drunk and disorderly. The ferocious drinking was his escape – and yet so was his music – from sexual abuse, from shyness, from the death of his parents and two of his closest friends and from the physical pain of a series of accidents. But escaping means not confronting and Donald brings home the human need to process all experience, good and bad. To be an alcoholic is to self-destruct by failing to do that. Donald, who tells us he has turned 70, might never have got that far, but for an epiphany at the village of Newbliss in County Monaghan that gives the play its title. Since then, the drinking has been replaced by writing and the need to tell an audience his cautionary tale. It’s as much a health warning as entertainment and, as cultural exchange, it confirms every European prejudice about doomed, drunken Irishness. But finally we’re rewarded with, as Donald puts it, “showtime” and a vigorous jazz flourish on his saxophone that leaves us wondering why the music alone couldn’t always have been enough. 100 Dutch-Language Poems	Hieronymous Bosch – Visions of Genius, North Brabant Museum, Den Bosch, the Netherlands.